This illustration is taken from the title page to the 1853 Report of the Penzance Natural History and Antiquarian Society. The quoit fell in 1815 and George John, at one time the Mayor of Penzance, wrote of the collapse in his diary1: "Thursday 19th October 1815 - This night the celebrated Cromlech of Lanyon called Lanyon Quoit was said to be blown down, more probably the violent rain has undermined or loosened the earth on which stood one of the supporters so as to occasion its fall after standing two thousand years at least probably much longer." The theory that the quoit was toppled by one of Cornwall's notoriously violent storms after standing for so many thousands of years has been questioned by some, but one only has to study the south western aspect of Stonehenge, which faces into the prevailing winds, to see the damage which can accumulate through thousands of years of adverse weather conditions. 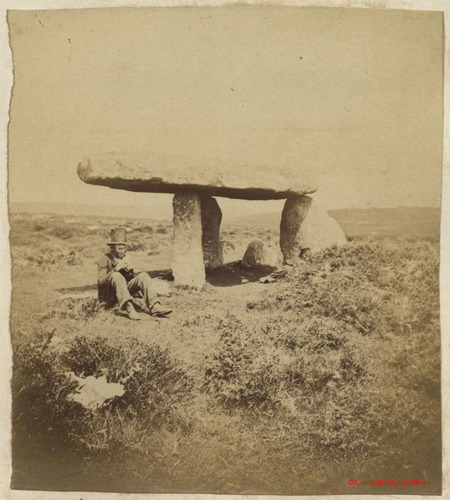 The 13½ ton capstone of Lanyon Quoit is one of the heaviest in Cornwall and measures 17½ feet by 9 feet. 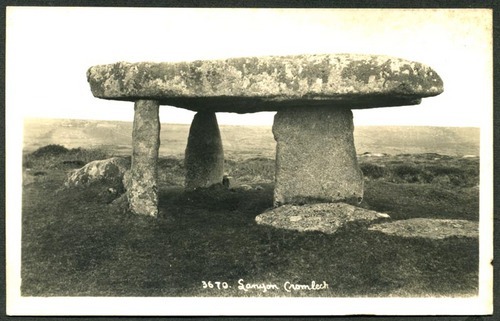 The cromlech was re-erected in 1824, thanks to funding raised by public subscription, by Captain Giddy of the Royal Navy using the same machine which had previously replaced the famous logan stone at Treryn Dinas. Page 23 of the 1813-1870 baptism register for St Levan2 notes that "On Thursday April 8 1824 Lieut Goldsmith, commanding the Nimble Revenue Cutter, with fourteen of his crew with handpikes &c threw the Loggan Rock about 3 feet from its base Wm Spry", and the following page reads "On Tuesday November 2 1824 Lieutenant Goldsmith, and crew replaced the Logan Rock. Wm Spry". The capstone of Lanyon previously stood on four uprights but due to damage caused by the collapse of 1815, it now stands on only three uprights and is some few feet shorter than it once was. Image courtesy of and © Cornwall Record Office. A late Victorian lantern slide of the cromlech. The engine house of Ding Dong mine can be seen to the right hand side of the view and is an ever present feature throughout most of the northern part of the Penwith peninsula. The monument, and the land surrounding it, was given to the National Trust in 1952 by Edward Bolitho of Trengwainton, and stands alongside the main road between Penzance and the north Penwith coast, making it one of the most accessible and frequently visited of Penwith's prehistoric monuments. Image courtesy of and © David Thomas. A H Hawke of Helston was a prominent local photographer and postcard producer of the first half of the 20th century and he photographed many of the churches and coastal features of the western half of Cornwall. 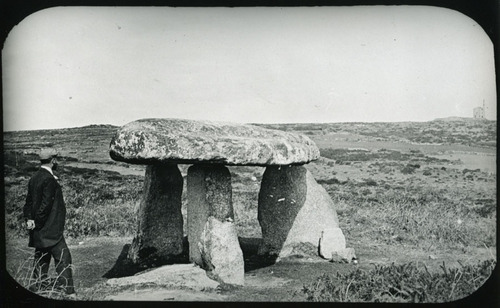 His images of prehistoric monuments are less abundant, and though he photographed Lanyon Quoit, the Mên Scryfa, Zennor Cromlech and the Pipers, it is to be regretted that photographs of the monuments closer to his studio, such as the Dry Tree menhir at Goonhilly, or the superb longstone at Tremenheere, do not seem to have been taken. 1. Cornwall Record Office, AD1426/2. 2. Cornwall Record Office, P122/1/2.